Dubai, UAE, July 07, 2018: The La Chaux-de-Fonds brand announces the creation of a new collection: La Grande Vie. Beautifully presented, a creative exercise in which, paradoxically, Corum rarely participates: the mastery of the classic and timeless codes of traditional watchmaking. The new collection “La Grande Vie” by Corum is the exception that proves the rule of the brand's unbridled creativity. “We wanted to have a collection with an elegant, classic design. It complements, following our customers’ demand, our most daring pieces”, explains J�r�me Biard, CEO of Corum. La Grande Vie adopts all the Corum codes by considering them in the light of permanent collections and timeless pieces, making them aesthetically accessible to experienced collectors and first-time buyers. To launch the collection, three pieces are already available. They join Corum’s “Heritage” collection. All share a 42 mm titanium case within which lies a beating Swiss Made automatic calibre (SW300), visible through a sapphire crystal case back. 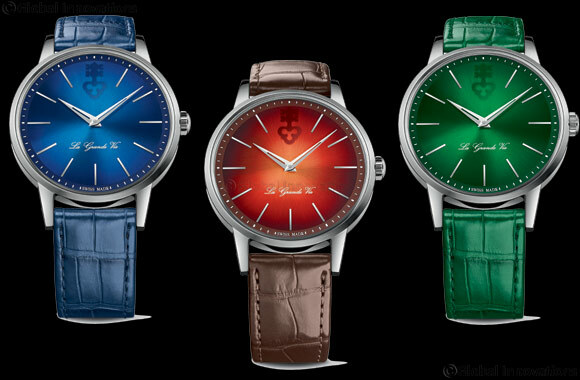 Their dials will probably attract the most attention, with a shimmering sunray finish in blue, red and green tones that magnifies each ray of light. From the center to the flange, this sunray finish gives the piece a radiant look. Baton hour markers are stretched out on the dials, which Corum wanted to be more elongated and thin than average, accentuating the “sunray” effect reflected by La Grande Vie. They come with “Dauphine” hands – a highly “classical” feature of the traditional fine watchmaking that is wonderfully exhibited here by Corum. At noon, the 12:00 hour marker is replaced by a large key – an oversized Corum logo – to leave the brand’s mark. Indeed, in the absence of the name “Corum” on the dial, watch enthusiasts will only know the identity of the brand that created La Grande Vie through this key logo. With an extremely well-considered positioning, La Grande Vie is worthy of taking the torch from Corum's timeless collections, such as the Charg� d'Affaires. This collection from the 1950s has long attracted watch enthusiasts for its mastery of classic watchmaking codes. Today, La Grande Vie follows its own unique path on the way to a redefined version of traditional watchmaking, also destined to leave its own mark.